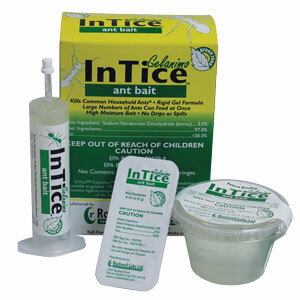 InTice Gelanimo Ant Bait features patent-pending “rigid hydro-gel” technology for no spills and no mess. Gelanimo is a broad label product, and can be used indoors and outdoors, including food areas. The high-moisture content of the bait has a consistency similar to gelatin that will not become sticky or gooey, and remains solid up to 130°F. Multiple ants can feed at once on the Gelanimo surface without drowning, enabling them to carry the bait back to the nest site. The recently redesigned 0.25-ounce small station features an easy-to-remove sticker covering the access hole and a low-profile design, allowing for quick, hassle-free placement in out-of-the-way locations. The larger, 4-ounce cup can be used for long-term control of heavy outdoor infestations, and is designed to be used with InTice Border Patrol Stations. Gelanimo is a Green Zone product, suitable for all service programs, including green ones. It’s packaged in boxes of 30 (0.25-ounce stations), 12 (4-ounce cups), and five (35-gram syringes).